Property Location With a stay at The Midtown Hotel, you'll be centrally located in Boston, steps from Boston Symphony Hall and minutes from Hynes Convention Center. This hotel is close to Copley Place and Boston Museum of Fine Arts. Rooms Make yourself at home in one of the 157 air-conditioned rooms featuring flat-screen televisions. Complimentary wireless Internet access keeps you connected, and cable programming is available for your entertainment. Bathrooms have showers and hair dryers. Conveniences include safes and desks, and housekeeping is provided daily. Amenities Take advantage of recreation opportunities such as a seasonal outdoor pool, or other amenities including complimentary wireless Internet access and concierge services. 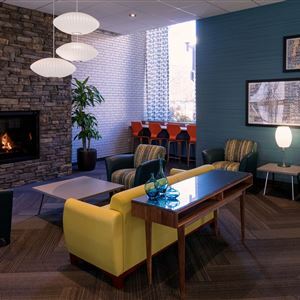 Additional amenities at this hotel include a hair salon and a fireplace in the lobby. Business, Other Amenities Featured amenities include a 24-hour front desk, multilingual staff, and luggage storage. Planning an event in Boston? This hotel has facilities measuring 2300 square feet (214 square meters), including meeting rooms. Self parking (subject to charges) is available onsite. 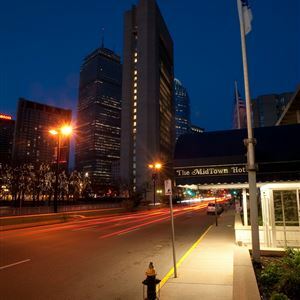 With a stay at The Midtown Hotel, you'll be centrally located in Boston, steps from Boston Symphony Hall and minutes from Hynes Convention Center. This hotel is close to Copley Place and Boston Museum of Fine Arts. Make yourself at home in one of the 157 air-conditioned rooms featuring flat-screen televisions. Complimentary wireless Internet access keeps you connected, and cable programming is available for your entertainment. Bathrooms have showers and hair dryers. Conveniences include safes and desks, and housekeeping is provided daily. Take advantage of recreation opportunities such as a seasonal outdoor pool, or other amenities including complimentary wireless Internet access and concierge services. Additional amenities at this hotel include a hair salon and a fireplace in the lobby. Featured amenities include a 24-hour front desk, multilingual staff, and luggage storage. Planning an event in Boston? This hotel has facilities measuring 2300 square feet (214 square meters), including meeting rooms. Self parking (subject to charges) is available onsite.